And/or choose Priority 2-Day Shipping Upgrade at checkout and your top will be shipped as Priority 2-day mail. The shirt was delivered prompt and in great condition. I absolutely love the top! Super cute and adjustable! Very cute, well made top. I have a larger cup size that can be fitted at a 36 D-DD or 34 DD depending on the style of bra. 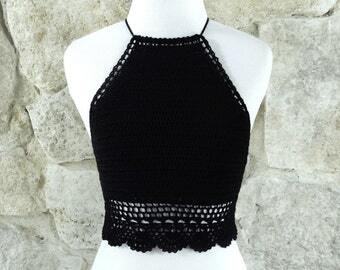 It’s a really cute top, but there is still a lot coming out from the sides. I think if I play with the strings enough I can get it to fit properly. It is very adjustable, but not as supportive as I thought it would be with the cups. Smaller cup sizes would probably fit better. We accept PayPal, Etsy Direct Checkout, and Etsy Gift Cards. No work will be started on any orders before payment in full has been received. 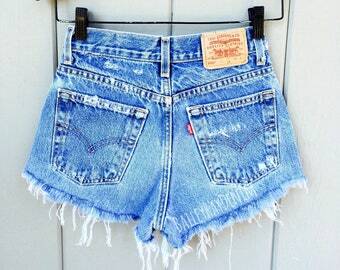 We do allow for exchanges on shorts sent back within 14 days of receipt; no exceptions. We accept exchanges only if the shorts are unworn. ONLY SIZE EXCHANGES; no hem, style/listing, or wash changes are allowed. Buyer pays all exchange shipping costs and will be asked to purchase our "exchange listing" to cover the cost of shipping the new shorts out ($8). Exchanges are shipped the first Friday after they are received. All buyers have the option to cancel an order within 24 hours of purchase. No exceptions. Standard Mail takes 3-5 days in transit and Priority 2-Day Mail takes 2 days in transit. All tracking should be included in the shipping confirmation email sent once your order is shipped. All shipping includes tracking, therefore we are not liable for packages marked as delivered but are stolen. Unsure which size to buy? Send us a quick message or text [(657) 223-3646] and we can help you out! We are always happy to accept returns/exchanges if buyers make an effort to select the proper size!